OEChem TK includes facilities to perform different types of pattern (graph) matching. Graph matching is based on node (atom) and edge (bond) correspondences. An atom which satisfies the conditions of a node in a query graph is said to match. Likewise, a bond which satisfies the conditions of an edge in a query graph is said to match. Pattern matching is the process of identifying groupings of matching nodes and edges. Substructure search, or subgraph isomorphism, is the process of finding a graph match which is less than or equal to a larger graph. Maximum common substructure search is the process of identifying the maximal graph correspondence between two graphs. Clique detection is the process of finding all possible correspondences between two graphs within a set of bounds. Substructure searches can be done in OEChem TK using the OESubSearch class. The OESubSearch class can be initialized with a SMARTS pattern, an OEQMolBase query molecule, or an OEMolBase with expression options. The following example demonstrates how to initialize a OESubSearch instance with a SMARTS pattern, and perform a substructure search. In Listing 1, the query pattern is benzene and the molecule in which the substructure is being searched for is toluene. Since benzene is a substructure of toluene the OESubSearch::SingleMatch method will return true. The SingleMatch method returns true if a single subgraph isomorphism is detected in the molecule passed as the function argument. Using the SingleMatch function in Listing 2, it is possible to loop through any molecular file and extract molecules that match a particular SMARTS pattern. The OESubSearch class is able to identify the atom and bond correspondences of the pattern and target structures. Listing 3 extends the simple match example to write out all atom correspondences between benzene and toluene. The OESubSearch::Match method performs subgraph isomorphism determination for instances of OEMolBase or OEQMolBase and returns an iterator over all detected subgraphs. Each of the detected subgraphs can be queried for their atom and bond correspondences. In this particular example, the benzene substructure is identified twelve times in toluene. There are twelve matches because the benzene ring can be rotated around for 6 matches, and then flipped and rotated around for another 6 matches, yielding a total of 12 matches. Each of the matches differ in their atom and bond correspondences to the pattern substructure. A match or subgraph is considered unique if it differs from all other subgraphs found previously by at least one atom. When doing unique matching, two subgraph matches which cover the same atoms, albeit in different orders, will be called duplicates and it will be discarded. In order to retrieve only unique matches, the Match method has to be called with a second argument being set to true. In Listing 3, using unique search would yield only a single match for benzene in toluene. An OESubSearch may be initialized using a SMARTS or a query molecule OEQMolBase. Query molecules must have atom and bond expressions built for the entire molecule to be able to initialize the search object (see OEQMolBase::BuildExpressions in the API). OESubSearch::GetPattern returns a read-only reference to the query molecule contained in an instance of OESubSearch. OEQMolBase methods can be used to interrogate the returned OEQMolBase reference. The OESubSearch::SetMaxMatches method sets the maximum number of subgraphs to be returned by the OESubSearch::Match method. Once the maximum number of subgraphs has been found the search is terminated. By default, an OESubSearch is constructed with the maximum number of matches set to 1024. The constraint on the maximum number of matches can be removed by calling OESubSearch::SetMaxMatches with a value of 0. The maximum common substructure (henceforth MCS) of two molecular graphs can be identified using the OEMCSSearch class. Listing 4 demonstrates how to initialize an OEMCSSearch object, perform a maximum common substructure search, and then retrieve the matches. The first molecule, pattern, is dopamine, and the second molecule, target, is a dopamine analog. The OEMCSSearch instance is initialized with the dopamine query, atom and bond expressions, and the type of the search. The atom and bond expressions define criteria for atom and bond equivalence used during the search and are defined in the OEExprOpts namespace. See the OEExprOpts Namespace section for more information. An OEMCSSearch object can also be constructed from a SMARTS string directly. In this case standard SMARTS matching rules apply for what constitutes a match. If it is constructed with an OEQMolBase, then whatever atom and bond expressions have been applied to the OEQMolBase will apply in the MCS search. The last argument of the initialization defines the search type, either Approximate or Exhaustive. The difference between the two search types is detailed in the Exhaustive and approximate MCSS section. This argument is optional, if it is not specified, then the exhaustive method is employed. During the search process, each identified common substructure is evaluated by a scoring function and only substructures with the best score are retained. The OEMCSSearch::SetMCSFunc method provides an ability to set the scoring function of an OEMCSSearch object, thereby influencing the result of the maximum common substructure search process. See the MCS scoring functions section for more information. The OEMCSSearch::Match method returns an iterator over the maximum common substructures. The OEMatchBase is then passed as an argument to the OESubsetMol function, and subsequently converted into a SMILES string. The maximum common substructure (highlighted by light blue) of dopamine and dopamine analog. The maximum common substructure search can perform unique or non-unique substructure searching by changing the second argument of the OEMCSSearch::Match method. The default is a non-unique search. By definition, a match or subgraph is considered unique if it differs from all other subgraphs found previously by at least one atom or bond. Additionally, it is also considered unique if the pattern subgraph is mapped to a different part of the target. Figure: Unique match shows an example in which the two matches are identified using the unique search method. Even though the two obtained subgraphs are identical, they represent different mappings between the pattern and the target, therefore they are both considered unique. Using a non-unique search would result in four matches, since the phenol can flip, yielding two additional matches. The search space of a maximum common subgraph determination can be restricted by constraining pairs of atoms or bonds to be mapped onto one another in all subgraph solutions. This is done using the OEMCSSearch::AddConstraint method. Failure to satisfy atom or bond pairwise constraints will prevent any subgraph solutions from being identified. Constraints are considered satisfied in subgraphs which do not contain any constrained atoms or bonds in either the pattern or target molecules. The AddConstraint method returns true if a constraint is added successfully. If the pattern atom or bond in the OEMatchPair does not exist as part of the query molecule created in the initialization of the OESubSearch object then AddConstraint will return false. Multiple calls to AddConstraint using the same pattern atom or bond will cause previously stored constraints to be overwritten as constraints are mutually exclusive. It is impossible to satisfy multiple simultaneous constraints for a single pattern atom or bond, hence the exclusivity. A read-only reference to the query molecule OEQMolBase contained in an instance of OEMCSSearch can be obtained with the GetPattern method. Note that if the OEMCSSearch was constructed with an OEQMolBase, the returned OEQMolBase is a separate object. OEQMolBase methods can then be used to interrogate the returned OEQMolBase reference. The SetMaxMatches method alters the maximum number of maximum common subgraph matches that will be returned by the OEMCSSearch::Match method. The search for maximum common substructures will not terminate immediately upon reaching this limit. The maximum common subgraph cannot be known unless the MCS is composed of all atoms and bonds of at least one of the graphs being compared. The limit of subgraphs to be returned may be reached with a smaller subgraph than the maximum. In such a case the search continues for larger subgraphs until the search is exhausted. OEMCSSearch::Match will return the first N maximum common subgraphs where N is less than or equal to the maximum match limit. The default limit set upon construction of an OEMCSSearch instance is 1024 matches. The SetMinAtoms method sets the minimum number of atoms required of a subgraph match to be returned by a MCS search. For example, changing the parameter of SetMinAtoms in Listing 4 to 11 would result in no solution since there are only 10 atoms of the largest maximum common substructure (see Figure: Example of MCSS). A single atom can be a perfectly valid maximum common subgraph, however, for many applications such a small subgraph may not be considered useful. Setting the minimum number of atoms to a useful size prevents unproductive subgraph matches from being returned by the OEMCSSearch::Match method. The default set upon construction of an OEMCSSearch instance for the minimum number of atoms is one. The maximum common substructure search can be performed in two different modes: a very fast method, OEMCSType::Approximate, or a more comprehensive method, OEMCSType::Exhaustive. The type of the OEMCSSearch can be set at initialization. The default value is OEMCSType::Exhaustive. The approximate method is based on traversing through pre-defined paths of the query structure and trying to map the visited query atoms into target atoms. Because these pre-defined paths represent only a fraction of all possible paths of a compound, it is not guaranteed that the approximate method can find the largest and all common substructures. Significant difference between the detected matches of the two methods could exist in cases when the query or target structure contains complex ring systems (fused or bridged) or stereo centers. However, comparing the two methods for thousands of structures revealed that these cases are rare and the approximate method provides a good trade-off between identifying MCS matches accurately and doing it 3 to 6 times faster than the exhaustive method. Figure: Approximate MCSS and Figure: Exhaustive MCSS, show an example where the substructure identified by the approximate method is smaller by one atom then the solution identified by the exhaustive method. Example for maximum common substructure identified by the approximate method. Example for maximum common substructure identified by the exhaustive method. Using the approximate MCS is recommended if the speed of the search is crucial. OEMCSFunc is an abstract base-class that defines the API used for scoring subgraph matches. The scores generated by implementations of OEMCSFunc influence the sorting and retention of maximum common subgraph matches generated by the OEMCSSearch class. The scoring function is set by the OEMCSSearch::SetMCSFunc method. It is important to mention that using different scoring functions does not alter the way the search space is traversed to identify common substructures. It affects only how these identified substructures are evaluated. Retrieved matches using ‘OEMCSMaxAtoms’ as scoring function. Retrieved matches using ‘OEMCSMaxBonds’ as scoring function. The default penalty for each unmapped cyclic query bond is 1.0. Retrieved matches using ‘OEMCSMaxAtomsCompleteCycles’ as scoring function. Retrieved matches using ‘OEMCSMaxBondsCompleteCycles’ as scoring function. It is important to remember that not only matches with the highest score are retained, but also matches with scores higher than the best score rounded down to the highest integer. 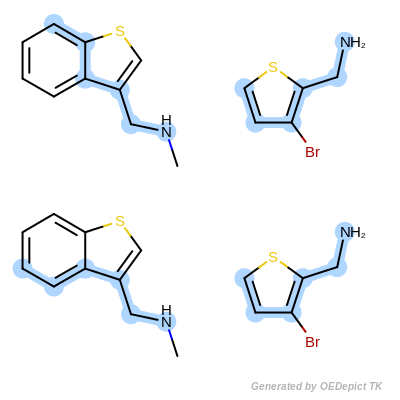 In the example shown in Scoring B three common substructures are detected using the OEMCSMaxBonds scoring function. The first two matches are scored 5.06, since they are composed of 5 mapped bonds and 6 mapped atoms. There is only one other match which scored higher than 5.0, this is the third retained match with a score of 5.05. Clique detection is a bounded common substructure search. It is a useful search method in cases where common substructures other than the maximum common substructure need to be identified. The following example demonstrates a clique search. The same molecules and expression options are used as in Listing 4, however, an iterator over all identified cliques is returned by the OECliqueSearch::Match method. The OECliqueSearch::SetSaveRange method bounds the search. In this case, cliques returned will only differ by five nodes relative to the maximum common substructure. The atom correspondences for each of the returned cliques are printed in the example program. Pattern matching in OEChem TK is always done using query molecules or query graphs. Non-query molecules, i.e. those that are defined only by OEMolBase abstract base-class must be converted into a query molecule. Conversion into a query molecule is controlled using the values in the OEExprOpts namespace. Expression options can either be specified in the constructor for an OEQMol, or using the convenience constructors in the pattern matching classes, OESubSearch, OEMCSSearch, OECliqueSearch which take expression options as arguments. Figure: Default example shows an example where the maximum common substructure search is performed using the OEExprOpts::DefaultAtoms and OEExprOpts::DefaultBonds options. The OEExprOpts::DefaultAtoms option means that two atoms are considered to be equivalent if they have the same atomic number, aromaticity, and formal charge. The OEExprOpts::DefaultBonds option means that two bonds can be mapped to each other if they have the same bond order and aromaticity. The best way to understand how various atom and bond expressions influence the pattern matching is to change the atom and bond expressions in Listing 6 and compare the obtained matches. After constructing the pattern molecule, the BuildExpressions method defines the level of atom and bond matching between the pattern molecule and any target molecule. By modifying the atom and bond expression options, very diverse pattern matching can be performed. Figure: Example A – Figure: Example E show several examples where maximum common substructure searches are performed for the same query and target molecules, but with various atom and bond expression options. In the first example in Figure: Example A, the OEExprOpts::ExactAtoms expression option is used to give a higher degree of discrimination of the equivalence of atoms, i.e. atoms can only be mapped to each other if they have the same degree, number of hydrogens, chirality, mass, and ring membership, in addition to the requirements of the OEExprOpts::DefaultAtoms option. Figure: Example B – Figure: Example E show examples where the discrimination capability of the OEExprOpts::DefaultAtoms is decreased by adding various modifiers. 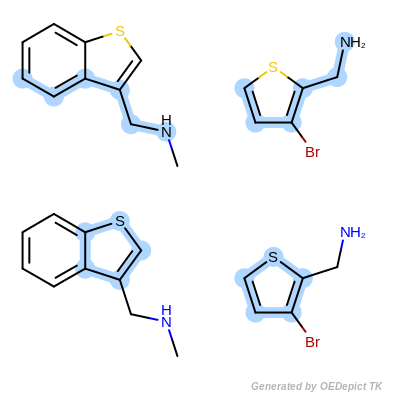 For example, using the OEExprOpts::EqAromatic modifier, atoms in any aromatic ring systems are considered equivalent. 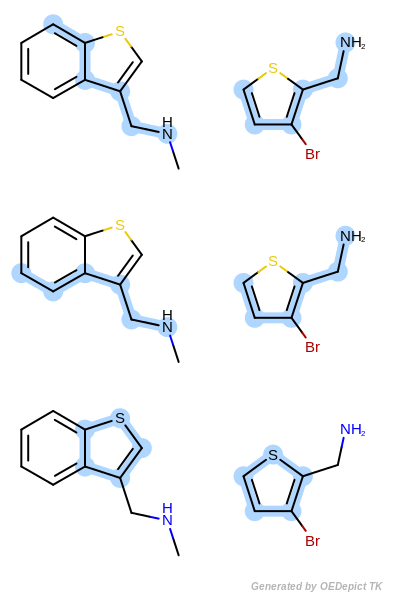 As a result, the pyridine and pyrimidine ring can be mapped to each other in Figure: Example B. Similarly, OEExprOpts::EqHalogen (Figure: Example C) and OEExprOpts::EqONS (Figure: Example D) define equivalency between halogen atoms and oxygen-nitrogen-sulfur atoms, respectively. Using OEExprOpts::EqCAliphaticONS (Figure: Example E) an aliphatic query carbon atom is considered equivalent to any oxygen, nitrogen, or sulfur atom. Similar modifiers exist for altering bond equivalency. 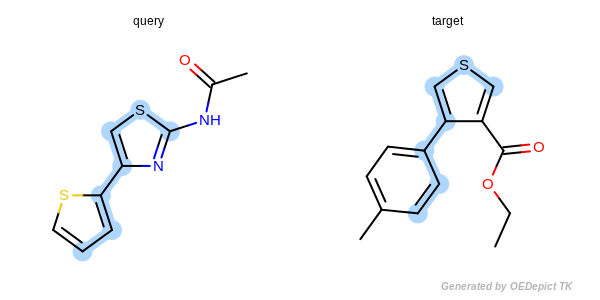 Figure: Example F shows an example where single and double bonds are considered identical when OEExprOpts::EqSingleDouble modifier is utilized. The last example in Figure: Example G represents a very unrestrained search, where both the atom and bond expression options have weak discrimination power. Even though only maximum common substructure search examples are presented here, atom and bond expression options can be similarly used with substructure searches or clique detections. For a full description of expression options and their usage please refer to the OEExprOpts namespace section in OEChem TK API.